China's national currency is the yuan. Locally, it's called the renminbi, which means "the money of the people." The renminbi is also the official name for the currency, while the yuan is a unit of the currency. It's pronounced as ‘yoo-ahn’. The Chinese yuan is on a fixed exchange rate. A fixed exchange rate is when a country ties the value of its currency to another currency. Exchange rates tell you how much a currency is worth in a foreign denomination. It’s the price being charged to purchase that currency. China, like most other countries, pegs its currency to the U.S. dollar for two reasons. First, it’s used for most international trade transactions. There are at least 65 other countries that either peg their currency to the dollar or use the dollar as their own legal tender. The dollar has been the world's reserve currency since the 1944 Bretton Woods Agreement. Second, the yuan plays a critical role in keeping China's economy competitive. America is China’s biggest trading partner. China manages its currency to control its export prices. It keeps them reasonably priced compared to U.S. competitors. Every country would like to do this, but few have China's ability to manage it so well. China's command economy allows the Communist Party to control the central bank and critical businesses. China’s use of the yuan for its competitive strategy is working. In 2014, China became the world's largest economy. In 2017, it produced $23.1 trillion in gross domestic product. This is more than what the European Union or the United States produces. But China must keep growing. Its standard of living is only $16,600 as measured by GDP per capita. It’s no better than many smaller countries like Iraq or Botswana. Chinese leaders want prosperity to rise for two reasons. People will buy more, allowing Chinese businesses to sell at home instead of exporting to the United States. Second, the Chinese people are willing to live under the restrictions of Communism only as long as their lifestyle improves. Historically, China pegged the yuan to a basket of currencies filled mostly with the U.S. dollar. It's kept the yuan's value in a 2 percent trading band around a "reference rate" that tracked the dollar's value. This was around 6.25 yuan to the dollar. In other words, one dollar could be exchanged for 6.25 Chinese yuan. The People's Bank of China must manually adjust the yuan's value to track that of the dollar. The dollar's value fluctuates because it’s on a floating exchange rate. To do this, the central bank must hold enough foreign exchange reserves to manage its currency's value. China's exporters receive dollars when they ship goods to the United States. They deposit them into their local banks, which transfer it to the central bank, in exchange for yuan. They use it to pay their workers and local suppliers. Instead of holding dollar bills, the central bank buys U.S. Treasurys. They can be sold quickly and pay a small interest rate. As China's economy has grown, it’s bought more U.S. Treasurys to meet the growing number of yuan being redeemed by its exporters. When the bank wants to increase the yuan's value relative to the dollar, it will use its dollar reserves to buy yuan from Chinese banks. By taking yuan out of circulation, the bank increases the yuan's value. By replacing yuan with dollars, it puts more dollars into circulation and lowers its value. In this way, China influences the value of the U.S. dollar. China has become one of the largest foreign holders of U.S. Treasurys. It gets concerned when the United States threatens to default on its debt as it did in 2011 and 2013. China also worries when the dollar's value declines. It calls for a new global currency whenever it sees its holdings of dollars lose value. In theory, China could threaten to sell its U.S. Treasury holdings and put the value of the U.S. dollar into freefall. It's not in China's best interests to do so though. By threatening to sell U.S. Treasurys, China would quickly devalue its own holdings. Even so, it's been unwise for the United States to allow itself to become so indebted to any other country. In 2018, President Trump accused China of currency manipulation. This is nothing new. The U.S. government has been complaining about China’s currency war since 2006. Many believe a higher yuan value will lower the U.S. trade deficit with China. In 2006, President Bush appointed Hank Paulson as Treasury Secretary to work with China to raise the yuan’s value and to open its financial markets to U.S. investors. Paulson’s U.S.- China Strategic Economic Dialogue was successful in that endeavor. Between 2011 and 2014, China allowed the yuan to rise against the dollar. It responded to U.S. pressure, but it also wanted to keep its economy from overheating and creating inflation. As a result, on January 26, 2014, the dollar to yuan rate reached an 18-year high of 6.0487 yuan. Since then, the People’s Bank of China has allowed the yuan to weaken again in order to boost exports and strengthen China's economic growth. China’s economic reforms had slowed growth too much. China wants the yuan to replace the dollar as the global currency. Its first step occurred in 2013. China allowed British investors to invest $13.1 billion or 80 billion yuan in its capital markets. This move made London the first major trading hub for the yuan outside of Asia. China also allowed forex trading in Shanghai. 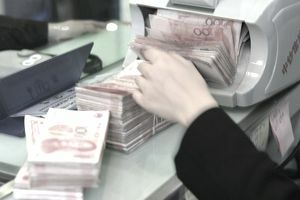 These steps meant that the yuan became the 11th most traded, the eighth most used for foreign transactions, and the seventh among currencies in countries’ official reserve assets. The next step occurred on November 30, 2015. The International Monetary Fund allowed the yuan to become an official foreign exchange reserve currency. It also required China to loosen its peg. To truly let the yuan float, China must allow all its residents to hold foreign currency as well as buy foreign assets. This would allow the Chinese government to hold fewer dollars. It would also lessen the trade imbalance with the United States. If China is guilty of currency manipulation, then so are many other countries. The United States was keeping the dollar low by maintaining interest rates at zero and accumulating the world's largest debt. This changed in 2014 when the dollar entered an asset bubble. Japan keeps its currency low by doing the same thing as China and buying dollars in the form of U.S. Treasurys. Even the EU has started lowering the euro by adopting its own form of quantitative easing. In other words, all exporting nations benefit from a weaker currency.